The east side of the South End of Boston has undergone a major transformation in recent years, the old warehouses in this district have been newly converted into luxury apartment buildings. To make the transformation complete, a new Whole Foods market just opened in January. My husband and I walked to the new location in the former Boston Herald building. While I was in Vietnam they had the grand opening. 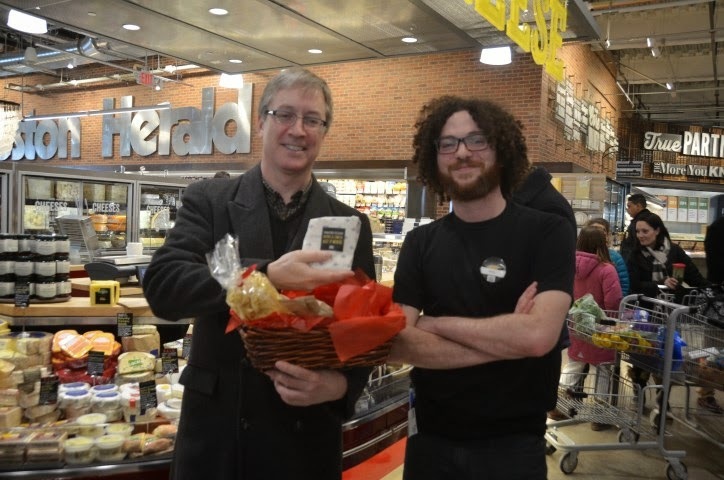 The place is quite impressive with a huge selection of fresh produce, wine and cheese. While shopping we heard the overhead announcement about a "Cracking the Cheese" contest. I told my husband that he should go and have a look while I explored. He found me and told me about it. We learned this contest is an annual event on how fast the cheesemongers will cut this 85-pound wheel of parmigiano-reggiano (cheese) in half. When I got to the contest area there was a crowd already gathered around this event. Since the cheese is soft I did not think that any of these guys would take minutes to cut it. I guessed 45 seconds. I guess great minds do think alike at times because my husband told me he just wrote down 44 seconds. He thought 45 was too close to his number, so I put in 50 seconds. The contest started, the two men worked quickly to score and stab at the cheese. The man on the right looked like he was not getting as far as the other, who had more experience, having previously cut 10 cheese wheels, but then he did something that split his cheese in half. My husband saw that the stopwatch of the coordinator, Claire, had stopped right at 43.9 seconds, and he ended up being the winner of this contest and took home a gift basket including a pound of the tasty cheese. We stayed for some wine and cheese tasting. Thank you Whole Foods Market for this interesting event and gift! 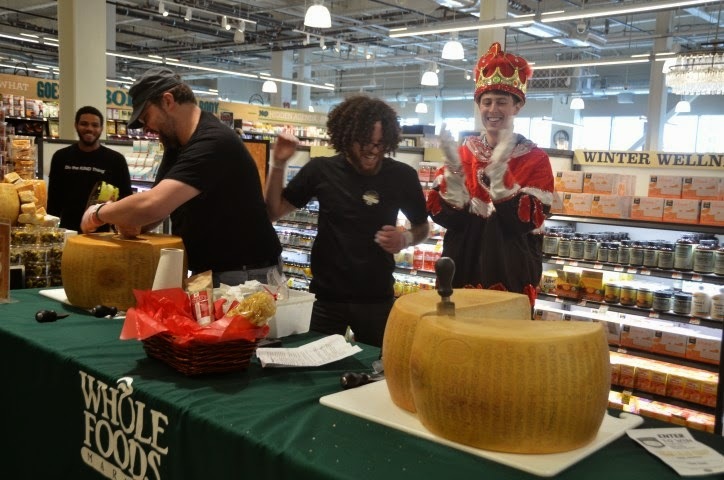 To learn more about this event you can check out their site: "Whey to go: Whole Foods Market cracks Parmigiano Reggiano Guinness World Records Title"